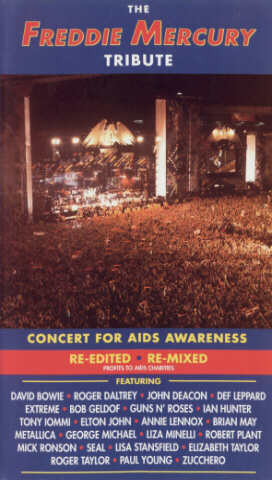 On April 20th, 1992, some of the greatest musical talent in the world gathered at London's famed Wembley Stadium to pay tribute to Freddie Mercury sho died of AIDS on 24th November 1991. The aim of the concert was to celebrate his life, to mourn his passing, to increase public awareness of the uncompromising disease that prematurely ended his life, and to raise much needed funds to help AIDS sufferers worldwide. The concert was broadcast live on television and radio to 76 countries around the world from the USA to Russia. The 72,000 people who were fortunate enough to see the concert live, did so in glorious spring weather in front of a stage 370 ft wide and 90 ft deep. The stage was flanked by scaffolding towers over 80 ft tall, and a giant phoenix - the symbol of the charity formed to distribute the money from the event - crowned the centre of the proscenium arch. At 6pm, John Deacon, Brian May and Roger Taylor, the remaining three members of Queen, took stage to announce the start of one of the biggest events in roch history and to pay tribute to their former colleague - the incomparible Freddie Mercury. The atmosphere of emotion, mixed joy and sadness, shared by stadium audience, worldwide television viewers, and performers alike, was an experience that will never be forgotten. The event is now captured here on video, a lasting tribute to be shared by all. ALL profits from this video will be donated by the Mercury Phoenix Trust to AIDS charities worldwide.